Pine Cliffs Resort is just a 30 minute drive from Faro airport, which is serviced by regular low cost flights from the UK, or 2.5 hours from Lisbon Airport. 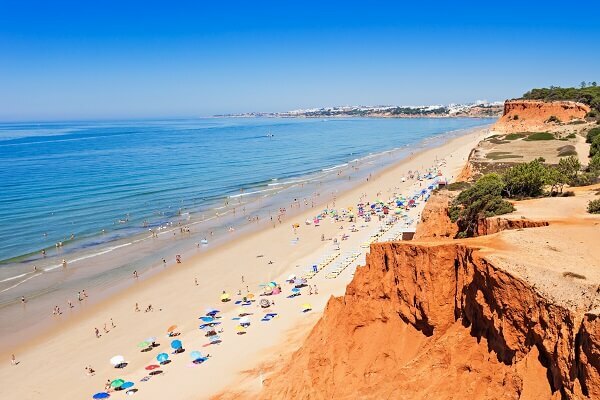 In between Albufeira and Vilamoura, 5 minutes from the charming fishing village Olhos de Água, Pine Cliffs Resort is directly on the beachfront of Praia da Falésia, with access by glass elevator and boardwalk to this beautiful blue flag beach. Taxis and direct shuttle bus services are available and hire car deals are easy to find. Public transport is inexpensive with regular daytime and early evening bus routes during the week and a weekend daytime service with approx 2 hours in between buses. If you haven’t hired a car and want to explore, there’s a regular bus to Albufeira, from where you can take the bus or train to explore the Algarve easily, or take advantage of the daily service to Lisbon for a visit to the capital. If you’re feeling active, you can hire bicycles from Pine Cliffs Resort. If you have any questions about transport please contact us for advice.